Camp Nirvana Guptkashi is located at an altitude of 1319 meter. Gupkashi offers a panoramic view of the Mandakini valley below, Chaukhamba, Mandakini Darshan, Badrinath, Neelkanth, Ukhimath and the snow ranges of the Kedarnath atop ahead. It is a major town before Gaurikund with services and facilities of a post and telegraph office, banks, a hospital, a police station and eateries. 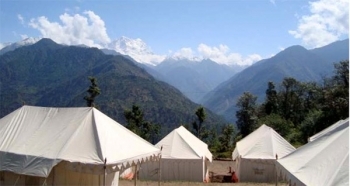 Camp Nirvana is situated 33 kms from Rudraprayag, towards Kedarnath. Excursions from Camp Nirvana Guptkashi: Few of the excursions are Kedarnath, Ukhimath, Chopta, Badrinath, Auli, Joshimath, valley of flowers, Hemkund Sahib. 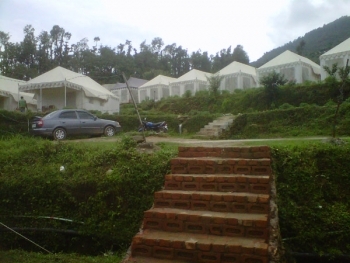 - Accommodation in spacious all weather proof Luxury Tents (24’ X 12’). - Attached bathrooms with running water & basic toiletries. - Multi cuisine pure vegetarian dinning facility. - Separate activity area for Aarti & Meditation. - Yamunotri Temple tour & guide service. - Escorted walks to near by Gangani Temple & villages. - Ayurvedic massage & Astrologer is available on advance notice. The multi cuisine restaurant at Camp Nirvana serves delectable fare. Tea is available throughout the day at the restaurant. Barbeque and bonfire evenings are also organised on request. - Yoga, Meditation & Astrology. By Road: Delhi - Haridwar - Rishikesh - Devprayag - Srinagar - Rudraprayag - Guptkashi. By Rail: Haridwar is nearest rail head (167 kms) to camp Nirvana in Guptkashi.